The Hotel Gloria de Sant Jaume welcomes you in the centre of Palma de Mallorca and is only 2 minutes walk from Paseo del Borne. As soon as you have set your first foot in the beautiful and antique entrance area, it is immediately clear that this is a top-class service. The family-run company and extremely courteous staff are passionate about their work. Who does not know the Boutique hotel Gloria de Sant Jaume yet, gets if desired a completely individual guidance by the architecturally, up to the last with much love for the detail restored building, from the 19th century. Here you will find many traditional elements such as beautiful tiles, exposed wooden beam ceilings and marble floors as well as a fountain. If you have been there once, you never want to leave again. Simply dive away from everyday life and let yourself be pampered! 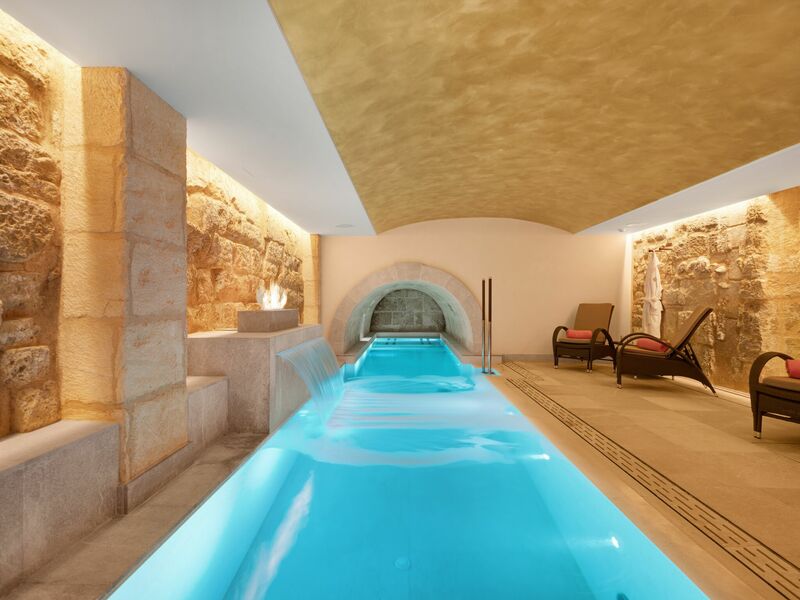 An absolute oasis of peace is the exclusive wellness area with the turquoise shining indoor pool and the Mediterranean selected materials, which create this very special feel-good atmosphere. A sauna, a hamam and a roof terrace with whirlpool and a fantastic view of the city complete the offer. Those who book early can start the wellness day with an extended brunch in the boutique hotel’s restaurant and then pass smoothly over and relax the afternoon with further massages, treatments and sauna sessions and let the soul dangle. The restaurant and bar at the Hotel Gloria de Sant Jaume can also be seen and have an excellent cuisine, so that you can either relax in the hotel or immerse yourself in Palma’s nightlife and try out the countless possibilities of stylish bars and restaurants. For the customers and business associates of Private Property Mallorca the Boutique Hotel Gloria de Sant Jaume offers further specials. Please do not hesitate to contact us directly! Do you know already the foodfriends Mallorca?